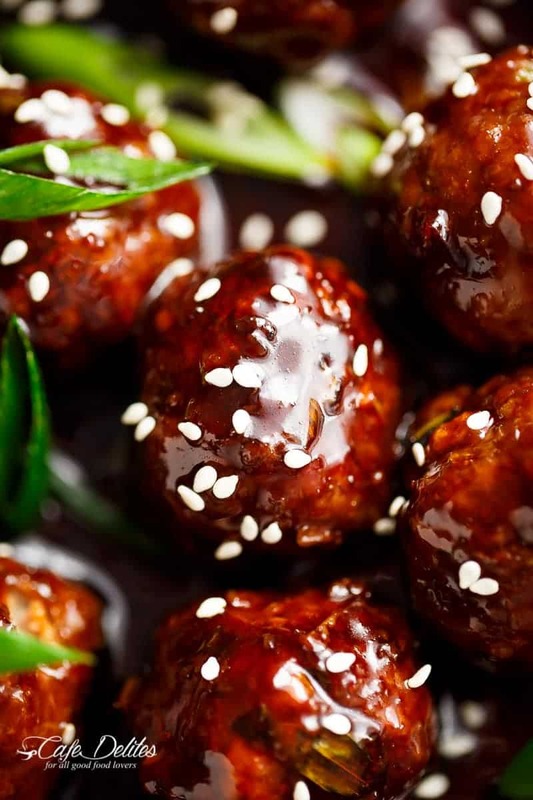 Tender Mongolian Glazed Meatballs are not only FILLED with Asian flavour — they are smothered in the BEST homemade Mongolian sauce to wow your guests! 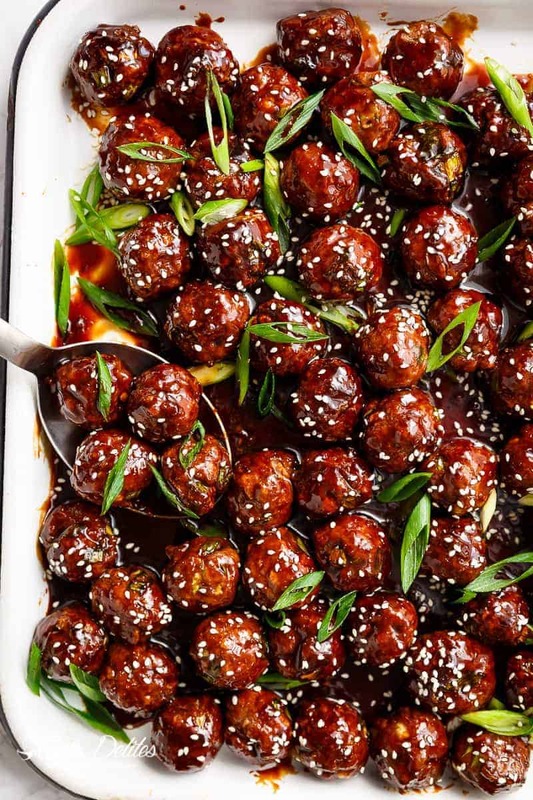 Well, I couldn’t leave you without a fire cracker of a New Years appetiser, AND these Mongolian Glazed Meatballs are everything! This is my second last post for 2016, and it can’t get any better than THIS! When I first posted this Mongolian Beef And Broccoli Recipe, so many of you guys wrote in to tell me allllll about how much you loved the flavours of the sauce; so this recipe happening was a no brainer. And, as it so happens, after a worldwide search on Google, this is another original Cafe Delites idea and recipe! First, you’re going to make your meatballs with simple and easy to find ingredients. THEN, you’re going to start a little production line: someone spooning the meat and someone rolling the meatballs. This way, you’re done in 5 minutes. Good, huh? If you can’t find anyone to help you out, well then just roll up your sleeves and get to it! The meatballs take 10-15 MINUTES to bake! That’s it? YES! And THEN, while they’re baking, you’re going to make the BEST Mongolian-style sauce *slash* glaze to coat your meatballs. By the time they’re done, it’s just a matter of coating and serving. 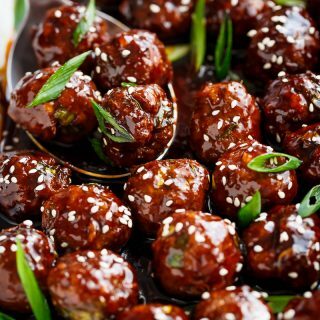 These Mongolian Glazed Meatballs were ready so fast I didn’t know what to do with myself afterwards. May have made a special brunch beverage for you all — coming tomorrow — which will be the last post of 2016. No better way to end the year than with a delicious alcoholic beverage. Am I right? 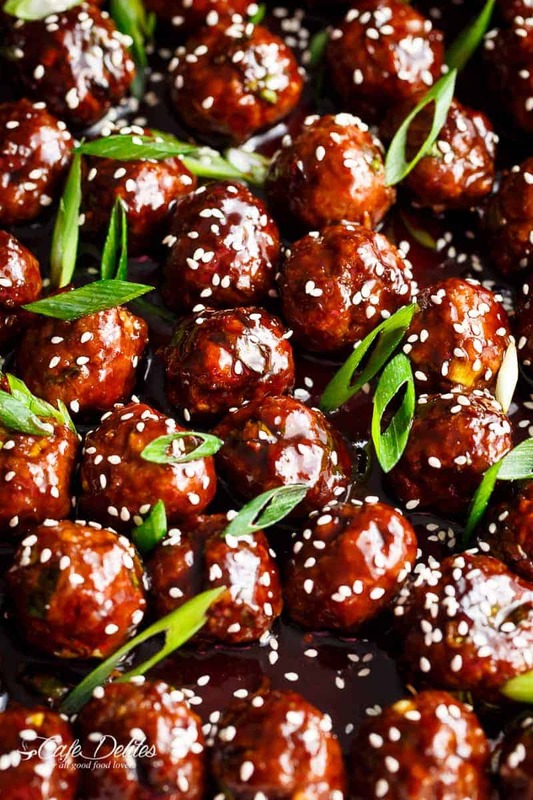 Tender Mongolian Glazed Meatballs are not only FILLED with Asian flavour -- they are smothered in the BEST homemade Mongolian sauce to wow your guests! 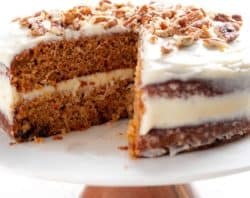 Another ORIGINAL Cafe Delites idea and recipe! Mix together all of the meatball ingredients in a large bowl until well-combined. Spoon out 1-inch of meat mixture with a cookie scoop (or tablespoon), shape into balls and place onto 2 large baking sheets or trays lined with baking or parchment paper. Heat a non-stick pan or skillet over medium-high heat. Whisk ALL of the sauce ingredients together in the pan until well blended. Bring to a simmer and continue cooking until sauce thickens, while stirring occasionally to prevent burning or sticking on the bottom of the pan (about 8 minutes). When meatballs have finished cooking, add half of the meatballs into the pan and gently coat each meatball generously and evenly in the sauce. Transfer the glazed meatballs to a serving dish or tray with a slotted spoon and add in the remaining non-coated meatballs to the sauce. Coat and transfer to serving dish. Sprinkle with sesame seeds and sliced green onions (if desired), and serve warm with toothpicks or mini forks. *If you can't find Shaoxing wine, use a Rice Wine Vinegar; White or Apple Cider Vinegar instead. wondering if you could do in a slow cooker? 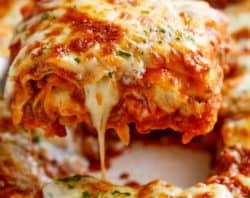 bake in the oven, then do the sauce in slow cooker to keep warm during party??? have you tried?? Thank you for the recipe. I enjoyed this and will make again. I did a few substitutions – truvia brown sugar blend and teriyaki sauce for the hoisin sauce. Since I used extra lean ground chicken and halved the recipe – it came out to 13 smart points for 20 large meatballs. I just madr these meatballs using your recipe and OMG they are seriously amazing!!! Thank you for sharing this recipe with us. It’s now one of my favorites! I used already cooked meatballs and coated them with bread crumbs for a little crispness (and because I didn’t have panko crumbs lol). So good! 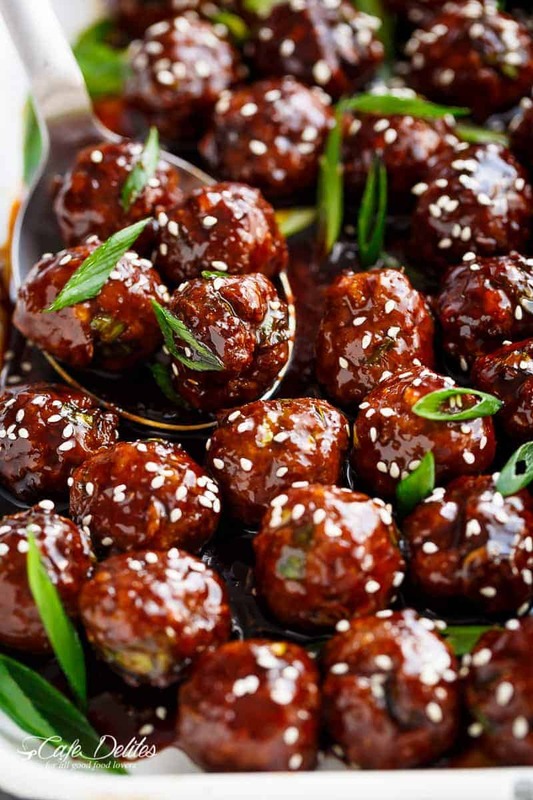 I’ve just looked looked at your Mongolian and Asian meatball recipes which have the same basic amount of components by weight yet the Asian recipe suggests it makes 40 meatballs (approx. 1 oz.) and the Mongolian 60 that would make them rather small. Is there a reason the Mongolian meatballs are smaller or can they be made with a one oz. scoop also. New subscriber and very impressed with your attention to detail and cooking suggestions. Would also appreciate more wine matching suggestions. Thanks so much for the feedback and letting me know about the wine matching. The bigger scoop would work great too. 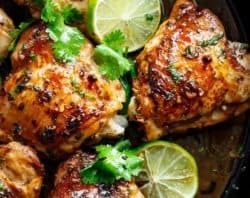 Hope you can find recipes that you love!! Thanks for following along with me! These are a hit..everyone loved them at my New Years Party! 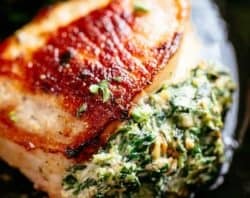 Will be part of my dinner rotation- thank you for the delicious recipe!! Awesome!! I doubled the sauce and thickened it with a little cornstarch so it really coated the meatballs. Yummy!!! Definitely a keeper!! That sounds great! Thank you so much for sharing! I am so glad that you enjoyed your meal! Made and cooked these these including the sauce (kept separate) yesterday and heated in the microwave for a luncheon today. Absolutely amazing! Had to cook the sauce for a while longer to reduce but everyone raved about them! Thank you! I’m not sure if the flavour would be the same with frozen meatballs Sugarshy! 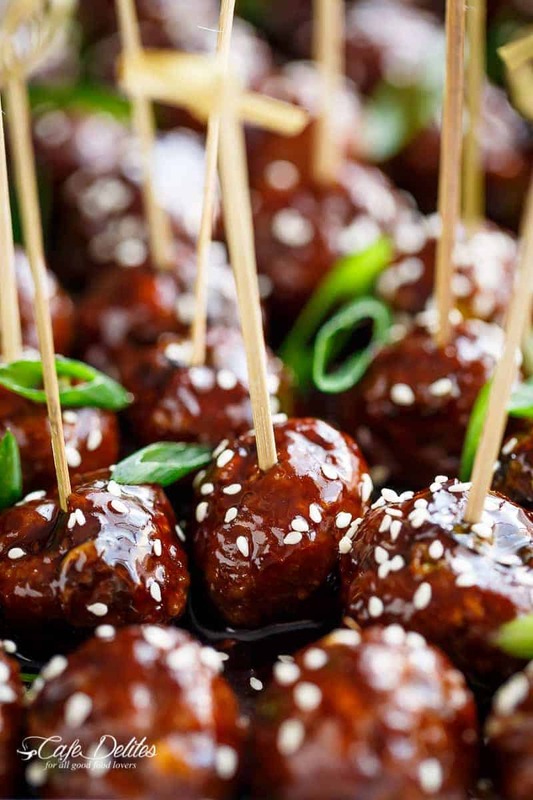 Trying the Mongolian Glazed Meatballs this weekend – can’t wait! Your recipes have inspired me! Can I keep these warm in a crockpot? -My sauce is not thickening, is there something I did wrong? or what can I do? 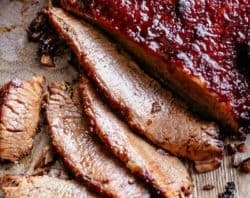 -I want half the size (1lb of turkey meat), do I just cut all the remaining ingredients in half? 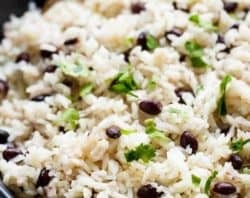 🙂 Love your recipes!! Cook them 2x a week!! Hi Katy! I really can’t say without being there with you! It takes about 6-7 minutes to start thickening. Did you allow enough time? And yes! For half the size of turkey meat, you will need to halve the ingredients 🙂 I’m sorry the sauce didn’t work out for you! *If you can’t find Shaoxing wine, use a Rice Wine Vinegar; White or Apple Cider Vinegar instead. i have tried a number of your recipes and they have all turned out great. On Christmas day I made the Christmas wreath. It was a hit. Making it again this weekend but using assorted baby, cherry tomatoes in all different colors, I look forward to your emails every day. Keep up the excellent work. And thank you. Best meatballs ever!! Thank you so much ! I enjoy taking credit for your awesomeness lol!! Lol AMY! Haha you cracked me up right now! You have an asterisk after the ingredient listing for Chinese wine. I don’t see corresponding commentary. 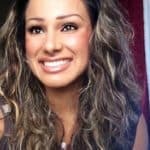 Is there a substitution you can recommend? Hi Shasta. Yes! Thank you for picking that up! The substitutions are now listed!